Patients who come to our Chicago dental practice know that we offer state-of-the-art restorative dentistry solutions. Whether treating tooth decay, gum disease, or tooth loss, we have a treatment that can help. People who are missing teeth know that the loss of even just one tooth can cause aesthetic problems as well as health issues. Let’s take a moment to go over these matters and then consider your treatment for missing teeth. In terms of aesthetics, gaps between teeth can be quite off-putting. This could lead you to feel self-conscious about speaking, laughing, and smiling, even around people you have known for many years. In terms of dental health, missing teeth can make it more difficult for you to bite and chew. This means issues with diet and nutrition that can impact your overall health. In addition to these issues, people tend to lose bone density and gum tissue as a result of tooth loss. This can result in teeth shifting out of position and further tooth loss if the problem is not properly addressed. One of the most common treatments for tooth loss is the use of a dental bridge. This is a removable appliance that literally bridges the gap when you are missing teeth. The bridge stays in place thanks to metal clasps and braces that are secured around the teeth that are adjacent to the tooth gap. Some patients prefer getting a fixed dental bridge for added stability. One fixed bridge option is the crown-supported bridge. Rather than bracketing around adjacent teeth, the bridge had a crown on either end. The crowns cap the teeth adjacent to the tooth gap for much greater stability. When you are missing many teeth in a row, a dental bridge is generally not a good option any longer. In these cases your best option is a set of dentures. Dentures remain in place by bracing around the gum tissue and bone structure of the dental arch. Special creams and dental adhesives can be used to secure the appliance in place. There are two kinds of dentures: partial dentures and full dentures. Partial dentures are ideal when a person is missing a few teeth in a row. Full dentures are used when a person is missing all or most of a row of teeth. For the most stable and well-anchored results, patients should consider dental implants. 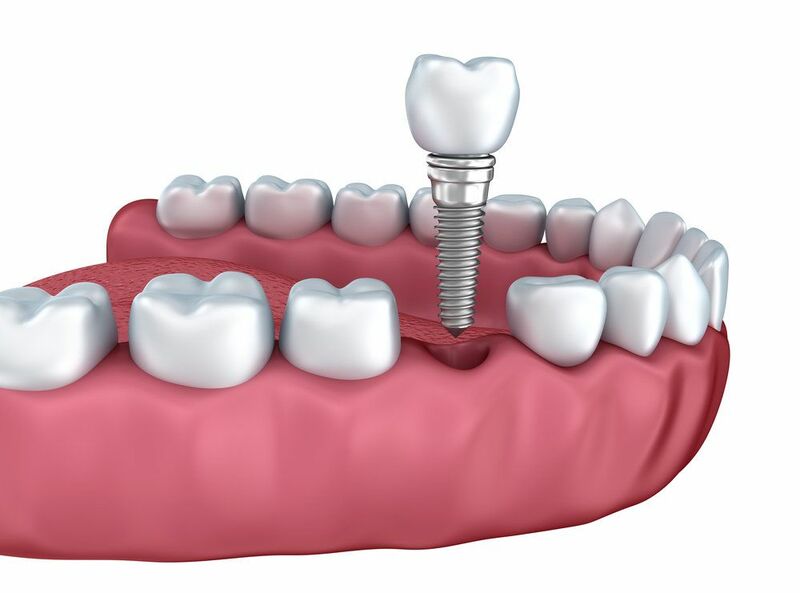 Dental implants are artificial tooth roots that are surgically embedded into the jawbone and gum tissue. These implants fuse with the bone, allowing the implants to provide optimal hold of different types of restorations. This means that bridges, dentures, and even individual dental crowns can be secured with dental implants. Since oral surgery is required to place dental implants, not everyone is a good candidate for treatment. In addition, there is the cost and time investment to consider. In addition to costing more than removable appliances, it will take a few months for the bone and implants to join together. During the consultation process, we will be more than happy to go over all of your treatment options in greater detail. This will allow us to tailor the restorative treatment to you needs and answer any questions you may have about the treatment process. For more information about treating tooth loss and improving your overall dental health and wellness, be sure to contact our advanced dental care center today. We will work with you to enhance your smile and improve your health in the process.